Clear canine jaw model showing the roots of all teeth. The model can be separated for better observation. 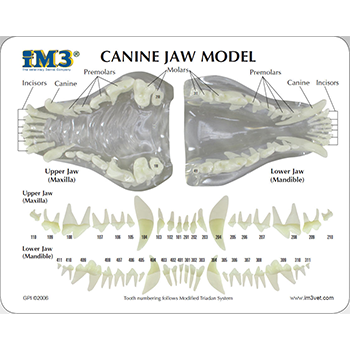 Included with the model is a plastic educational card showing the tooth and root location as well as the triadan numbering system for easy identification. Model size 12 cm x 7 cm x 5 cm (4 3/4” x 2 3/4” x 2)"
Clear feline jaw model showing the roots of all teeth. The model can be separated for better observation. Included with the model is a plastic educational card showing the tooth and root location as well as the triadan numbering system for easy identification. Model size 12 cm x 7 cm x 5 cm (4 3/4” x 2 3/4” x 2)"
The two part Rabbit skull model allows you to observe the tooth and root pattern of a typical rabbit.